Recently an advance copy of Ellee Thalheimer’s new guide, “Cycling Sojourner – a guide to the best multi-day tours in Washington“ landed in our inbox. After digging through page after page for the past 3 weeks, we thought you might like to hear how this book stacks up. Covering more than 1300 miles, in 40 days, and crossing 6 high mountain passes in 9 multi-day tours ranging from 2-6 days, Thalheimer’s routes span the wide topographic diversity of Washington from the misty San Juan Islands and suburban Seattle to the high Cascades and amber colored deserts of the East. 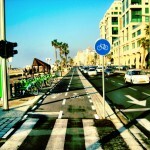 Included in the mix are routes for accomplished and beginner bike tourists alike. Looking for an easy weekend jaunt out of the city? No problem. Planning to plumb the depths of Washington’s expansive interior? Gotcha covered. And even though it would be virtually impossible to cover every single great route around the state, Ellee and her contributors have put together a great collection of tours to give you a window into what Washington has to offer. General route advice, water sources and arrival/departure info is all neatly spelled out to make pre-tour planning easy. Listings for regional websites, tips on weather and approximate tour costs give the would-be tourist a glimpse of what to expect along the road. And two-color illustrated maps and cue sheets round out route navigation. Yet, there’s so much more to this guide than ‘where to ride your bike’. Following on the success of Cycling Sojourner – Oregon, Thalheimer continues with the same conversational style of writing that makes you forget your actually reading a guide. The book reads more like a good friend’s (highly detailed) tour account, than the typical dry recitation of data in ‘traditional’ cycling guides. One of the most unique features of this guide is the attention given to each tour’s local culture and environment. The descriptions elegantly weave a narrative of regional history, food & drink, museums, and the other extracurricular things that draw bike tourists out of the saddle and into the local culture. 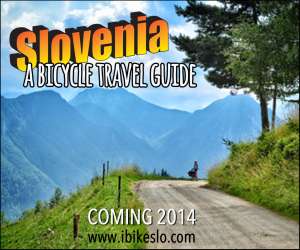 This is exactly this type of approach that we’re using on our own upcoming guide book: “Slovenia – a Bicycle Travel Guide“. We agree with Ellee and the gang, bike touring ( or as we like to call it “Bicycle Travel“) is about so much more than just pedaling from point A to B. The bicycling part is great. We love it. But it’s the places, faces and experiences along the way that make bicycle travel so special. Cycling Sojourner illustrates this fully. Looking for a brewery at the end of a long day in the saddle? More than 16 are listed here. Want to find a great swimming hole along the way? Jump in. Need to find the best Cheeseburger in Central Washington? Chow down. Buy it. Even if you don’t plan to follow the each and every route of Cycling Sojourner from start to finish, the value here is inspiration. The inspiration to discover from a bike’s saddle, all the gems hiding in the hills and valleys of Washington and its communities. Ellee and her gang of contributing authors have packed so much valuable information into the book’s 200-some odd pages, anyone who plans to travel by bicycle around Washington will surely benefit from their hard work and eye for detail. Cycling Sojourner – a guide to the best multi-day tours in Washington launches on May 1, at an event in Pioneer Square (downtown Seattle) and is available for pre-sale on the Cycling Sojourner website. 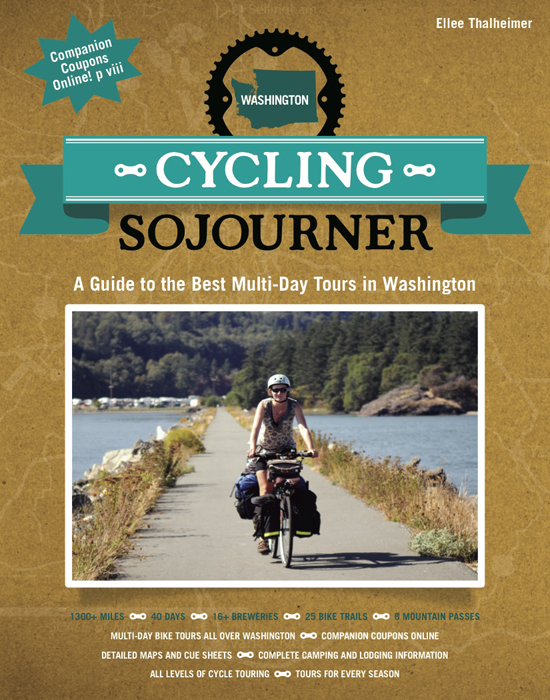 “Cycling Sojourner – a guide to the best multi-day tours in Washington” landed in our inbox. After digging through page after page for the past 3 weeks, we thought you might like to hear how this book stacks up. Washington Bikes is the nonprofit advocacy organization that supported the book’s production and we’re so thrilled to have it out! Royalties from sales of the book will support our work to make bicycling even better by getting more funding for trails and bike lanes and getting policies in place to create a safe, connected, comfortable, FUN network for all kinds of riders. We’ll be adding information on our website (www.WAbikes.org) about other destinations, and we’re building an online Coupon Companion of special offers from businesses recommended in the book. We’re also mapping the US Bicycle Routes in Washington and will be putting information up about riding those. Ellee’s great–if you get the chance to meet her and be inspired by her she’ll have you out on the road in no time! I haven’t tackled multi-day tours yet and am really looking forward to exploring with her expertise in my back pocket.